The United States has three requirements in returning to the Gold Standard. They will be extremely difficult to achieve. They each serve as essential requirements in a criterion. All three are urgently needed. The challenge is formidable for the nation to remain as a leading player in the global economy. The United States stands alone in volume of national debt. Many place the blame on the social net like welfare, Social Security, and other measures. However, the biggest element is clearly the military budget, hardly for defense in the last two decades. As CEO Jack Ma of Alibaba stated so succinctly, the USGovt has spent $25 trillion on the military with nothing to show for it except decayed infra-structure and global animosity for its aggression. A major item in recent years for the deficits has been Medicare, which is full of fraud and waste. Another major item is the raft of pensions like for government service, judicial service, and military service. Back in 2017, US President Trump commissioned a study to verify the status of the US gold reeserves. He and Vice President Pence, who led the study, were shocked to learn that the Fort Knox gold had been stolen. Of course, such a discovery never reaches the national news in broadcast or printed form. Thus the long delay in any conceivable effort to set up the $1 trillion infra-structure program promised during his campaign for office. The gears switched to locating and rescuing the stolen gold, with dirty fingers identified for ex-Presidents Papa Bush and Bill Clinton, along with the Wall Street crowd of criminals led by Robert Rubin. Rumors are ripe that the gold has been recovered, which also never reaches the controlled news networks. The eager await confirmation. The United States Govt cannot institute and implement a Gold Standard for its toxic USDollar in any practical form whatsoever, without first putting back into balance its trade deficit. The disastrous suicidal trend of outsourcing industry from the US base has resulted in a devastation to the urban centers, to a dilapidation to the infra-structure, to a loss of legitimate income, to a dependence upon debt for continuing the standard of living, and to a sick addiction to asset bubbles. Worse, the result has been an absence of bond investors for USGovt debt auctions, to the point that QE bond purchase program has become a national fixture. The US boasted for 20 years that Japan was a path not to be followed. But the US, true to Jackass forecasts on both counts, ended up with Zero Percent Interest Program and Quantitative Easing. The ZIRP resulted in grotesque asset misallocation. The QE with unsterilized hyper monetary inflation has converted the entire Western financial system into a global imprint of the Zimbabwe case, with reflections of South America. The United States must embark upon a national emergency program to form at least 20 to 30 thousand new businesses every year within free trade zones in all 50 states. It should be treated as a national survival initiative in order to avoid falling into the Third World. The businesses must be granted tax relief for three to five years at least, with respect to income tax levies and to property tax levies. The emphasis for the new businesses must be in export trade, in order to bring in foreign currency, so as to reduce the gargantuan crippling obstructive $600 billion annual trade deficit. If not executed with success, the consequence will be obscene and broadbased shortages, since anything not nailed down will be subject to export. That means agricultural output will be shipped out, resulting in food shortages. The unique aspect of the current RESET with respect to gold is the many reports of hidden large gold treasure troves. Behind the scenes for the last 20 years or more have been focused battles, complete with murders, downed aircraft, hired high power attorneys, hidden projects, protected leaders, bribery by bankers, captured websites and false identities, confiscated income, and much more. History might someday tell the stories properly, but since such large scale, and so critical to forming new global boundaries, only the victors will recount the stories. Each gold trove is worth in the multiple $trillions for magnitude. In the Fort Knox case, only half $1 trillion. Any usage of multi-$trillion treasure troves brought forward for implemented usage, whether in fractional form, will change significantly the entire global financial structure. The Yamashita Gold was hidden during World War II in the Philippines in mountain vaults. It could contain over 170 thousand tonnes gold. It is known by many other names that include Eagle and Lilly. Reports are sketchy but the gold appears to have stolen by the Imperialist Japanese during a century in occupation of China, complete with pilferage and mass genocide. The stolen Fort Knox gold was taken during the Clinton Admin, with involvement by the Philippines once again. This time 1.3 to 1.5 million 400-oz gold bars were recast and replaced by tungsten, bearing a thin gold clad. The principal victim in the fraud was the Hong Kong banks, which are being given relief in restitution on a monthly basis. See the USDept Commerce reports under the strange ledger item of Industrial Metals & Supplies. The Gold Treasure of Chinese White Dragons consist of a network of elite families, whose wealth accumulation could stretch over a few milleniums, during several dynasties. They have a rumored 115 thousand tonnes gold. Some of their bullion was leased to London around 50 years ago, surely earning some interest. However, the leased gold was improperly used to create the foundation of the Euro Monetary Union, complete with fraud aided by Goldman Sachs in betraying the Maastricht Rules for entry. Around 30 thousand tonnes gold was repatriated by the Dragons from London from March 2012 to end 2014, with the assistance of the Interpol Fraud Division and a crack team of attorneys. Old legacy USTreasury Bonds with gold backed guarantees remain a big mystery. Rather than being treasure troves, they are the opposite. China appears as owners of the legacy bonds, which the USGovt, in its usual inimitable style, continues to renege upon, using flimsy claims that the bonds are too old to be redeemable. The exceptional nation again is exceptionally dishonorable and corrupt to the core. The newest item perpetuates the deep intrigue. Ben Fulford has been stirring the global cauldron of golden soup with stories of the Mongol Gold Treasure, kept in Switzerland about one hundred years ago, which was improperly used to set the foundation for the little nation creation on the southeastern end of the Mediterranean in 1945. Its dispute could be at the center of the hidden negotiations for North Korea.The tonnage volume is not clear, but it could be more than 20 thousand tonnes gold. The entire unification of Korea could entail the formation of a Mongolian Regional Empire, possibly in the form of a trade zone, maybe even fortified by a new gold-backed currency. Expect the region to become a participant in the Eurasian Trade Zone, even while defusing constant nuclear tensions, which the Western cabal thrive upon, promote so well, and thrive upon. 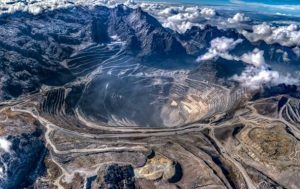 Just last week, the Indonesian Govt has wrested control of the biggest gold mine on the planet. The Grasberg Gold Mine is no longer under globalist banker cabal control. It has been the site of hidden warfare. The story unfolding should be very interesting. Its size is immense. The photo is impressive. Its 2016 year production: 1.063 billion pounds copper, 1.061 million ounces gold, and 2.9 million ounces silver. Its owner operator is Freeport McMoRan. This entry was posted in ARTICLES, CORRUPTION, DEEP STATE CRIMES, EDUCATION, NEWS, REPUBLIC, RESOURCES, SOLUTIONS and tagged Currency Crisis, Gold Standard, Gold Standard Requirements, Golden Jackass, Jim Willie by Republic for Michigan. Bookmark the permalink.